For all of the eccentric and eclectic Porsche collectors and enthusiasts out there, we've decided that it is about time someone aggregated the best of the best that eBay has to offer in the Porsches-for-sale department. We've tracked down five exciting Porsches for folks to purchase today, including a low mileage example of Porsche's ultimate GT3, what is possibly Porsche's best car ever built, one of the Urban Outlaw's 930s, a very low down 996 C4S, and a 993-engined 74 911S that would be at home hanging out with the R-Gruppe guys. Some of these cars could be great collection investments, while others might prove to do more financial harm than good. Porsche's mega Carrera GT supercar is widely considered one of the last analogue supercars to ever be built. It eschewed intrusive tech and fancy computers in deference to a wide stance and sticky rubber mated to massive earth-moving levels of engine power. This is a car for truly capable drivers. The Carrera GT doesn't have a particularly intrusive traction control system, so it requires a deft pedal control to keep pointed in the right direction. You might think that the price here is a good return on initial investment, gaining just over 100,000 dollars in 10 years. Taking inflation into consideration, this Carrera GT has actually lost about $7,000 in value. Even so, at that rate, the seller has only paid about 2 dollars per mile to drive this beautiful CGT. With only just over 3000 miles on the odometer, however, I'd be inclined to think the owner wishes he had racked up a few more. Cars are meant to be driven, so get out and drive them! Magnus Walker's Turbo Fever has hit the world and spread like wildfire. The early 3.0 liter Turbo models are exploding through the roof in value lately, and as has been proven in the past, anything touched by the Urban Outlaw becomes a hot commodity. 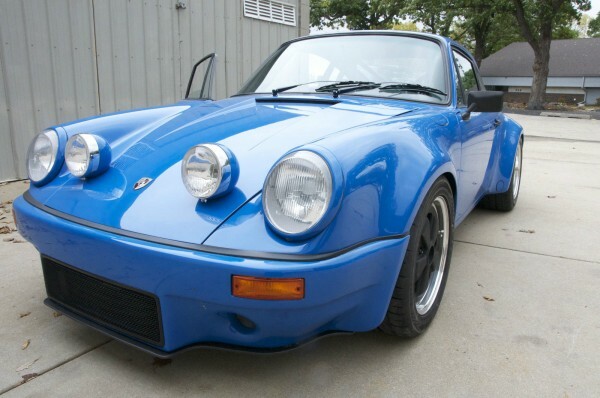 The bidding on this car is already well into the six figure range, which is slightly high for a 930, but not by a lot. Is this the future of the 930 market? Will all cars soon be in this price range? When Magnus picked up the car last year, it wasn't exactly in tip-top condition, and it wasn't running all that well. He decided that the car was due for a complete engine overhaul, including rod bearings, piston rings, a full bevvy of new gaskets, new oil lines, and a new clutch, among others. Everything that was reused was cleaned and refurbished as needed, essentially giving the car a like-new engine. At the same time, the turbocharger and transmission were rebuilt to like-new condition. The interior is in decent condition for its mileage, but the driver's seat has a tear, both door panels have blemishes, Walker does not have the original steering wheel, and the original Blaupunkt radio has been replaced by a late model CD player. New Bilstein shocks at all four corners, mated with Pagid RS brake pads, and Toyo R888 tires make sure the car is in prime condition for spirited street driving. When the GT3 RS 4.0 was introduced at an MSRP of $185,950, some people thought the sum a bit crazy. That's a lot of money to pay for a car, no? Well, in the interest of fairness, the RS 4.0 is a lot of car. They say you get what you pay for, but based on the way the RS 4.0 market has gone recently, it would seem that the cars original buyers got a little more than they paid for. Exceptionally kept 4.0s are now trading hands in the mid-300s, pretty darn close to double what they cost from the factory. Being the ultimate iteration of the 997 chassis, and the final street-car to bear the amazing Mezger derived engine, the RS 4.0 is certainly garnering some attention in the second-hand market. This car has already been owned by two owners, but neither of them racked up any appreciable miles. The car sits almost exactly the way it did when it left the factory, and is presented as practically new and in immaculate condition. For good reason, the best examples of rare cars like this always carry a serious monetary premium. This Porsche low-rider looks particularly exciting to my eyes. There is something to be said for the "stance" culture of car enthusiasts, as they can certainly make a car look more like art than any manufacturer can. Certainly much of the car's functionality is reduced, but what costs should one pay for art? Unlike some stanced cars, this car isn't quite too extreme to be used regularly. It sits on a set of Bilstein coilovers, which have been set to what must be their lowest setting. The wheels have not been tweaked to the point of extreme camber, giving the car an appearance of 'extreme-track' use, rather than extreme uselessness. With lower wheel arch gaps and a lower ride height, this Carrera 4S looks almost like it could have been a concept car. That's the point, isn't it? On to even better news, the car has already received an upgraded ceramic intermediate shaft bearing, meaning it should provide several years of reliable motoring. Additionally, the car has a Phoenix Performance Exhaust system and a K&N intake system for a few additional ponies and a massively improved sound. With a Buy It Now price of $36,500, you could drive this piece of mobile art to a car show near you. Having been featured in a number of magazines, including Total 911, and European Car Magazine, this Carrera Lightweight is an intriguing offering. With a 300 horsepower 3.6 liter engine, and only 2500 pounds to haul around, this beast is sure to be a screamer, and the beautiful arrow blue paintwork and IROC body make sure its a looker as well. The car has received a thorough going-through, and has received literally hundreds of upgrades. The braking system has been upgraded to full 993 specification, featuring 'big red' calipers and 304mm rotors at all four corners, plus a 23mm upgraded brake master cylinder. The suspension has been upgraded featuring Bilstein struts, turbo tie rods, modified spindles, Sanders 23mm front and 32mm rear torsion bars, Polygraphite torsion bar bushings, Tarett Engineering drop links and sway bars, Rennline rear trailing arm, monoballs and steering rack spacers. 16X10 and 16X8 3-piece Accumoto Wheels (built by Jongbloed) make sure that all of the power makes it to the road. Starting with a non-sunroof coupe model, the body was widened with all steel material. IROC bumpers were tacked on, as well as a Getty ducktail. Sourcing some original Cibie foglamps didn't prove easy, but they sure look the business. The jack points, windshield washer nozzles, and hood badge were all deleted. Inside, a set of Rennline pedals, track mats, and floorboards, accent the floor. Rennline also supplied the shift knob, e-brake handle, and shift linkage cover. An OMP quick-disconnect steering wheel hub behind a Momo Prototipo was added for a real racer look. A set of RS door cards and pulls give the car some Porsche street credit, and Status carbon kevlar seats on custom brackets keep the driver in place. Whether you want this car for instant entrance to the R-Gruppe, to take to the race track and absolutely embarrass anything Porsche has made in the last decade, or you just want it to look good on the street, this car has something for everyone. Beautiful and brutally fast.